With a WBPL Library Card, you can borrow almost anything from the library’s collection. Most items check out for 3 weeks (21 days) and can be renewed as long as no one is waiting for them. Other than the 3 week loan times, these are these are the special exceptions. DVDs, CDs, Video Games, and Cake Pans check out for a 1 week (7 day) period. While we don’t have many items classified as reference, those that are may not be checked out. With the help of library staff, up to 6 pages can be copied from them at no cost. Those items borrowed from other libraries are generally for a 3 week period. 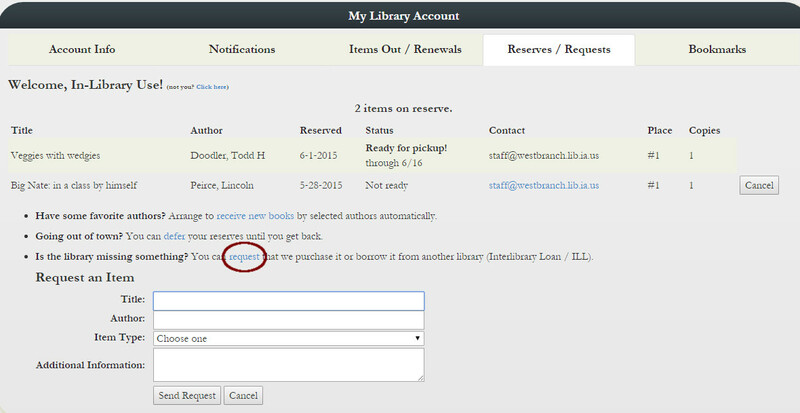 However, all loans from other libraries are subject to the lending library’s checkout times. At the library, we know that it can be tough to keep track of all the items you’ve checked out, especially with multiple family members mixed with different formats and checkout lengths. To help keep up, there are a few different ways to keep up with what you have checked out. When the library’s open, you may always visit the library or give us a call to find out what’s on your account. At any time during the day, you can check your account online. From there, you can view what items you have checked out, renew items that are eligible (no one waiting and are under the 3 renewal limit), and change notification options. Visit the guide on how to access your account if you have never done that before. If you have any problems at any point, please contact the library. You can also set up automatic emails or texts to be sent when something is 3 days from being due, giving you the chance to renew or return it prior to the due date. If your account includes an email address, it can also send you a receipt when someone checks out materials on your account. This is especially useful to keep family accounts under your control. While we do the best to make sure we have a wide range of materials for your interests, the library doesn’t own everything. If there’s anything you’re looking for that we don’t have, you can ask us to try to find it from another library. There’s no cost for an Interlibrary Loan; though donations are happily accepted, and it generally takes a week to a week and a half to receive a requested item, provided that it’s easily available at another library. Through accessing your account, you can bring up the Reserves/Requests tab. From there, fill out the information on the item that you’re looking for and we will process your request as soon as possible.